The following is a write up of a seminar given at Noah’s Café in Tokyo. 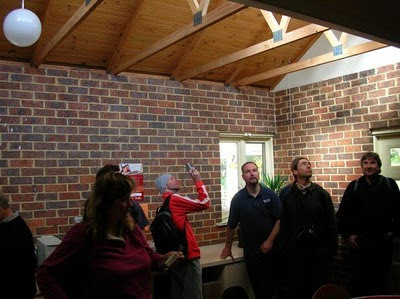 The focus of the seminar was suggesting potential retrofits to the café to reduce the heating costs. 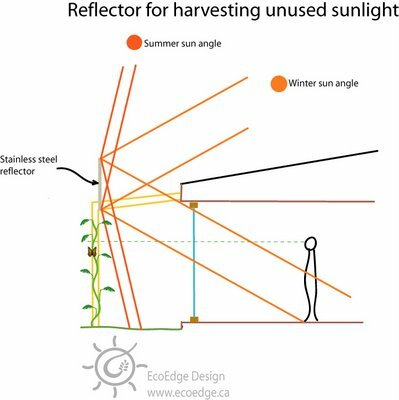 More will be written on passive solar design in the future, but for the purposes of this article, we will just look at enough to understand how to retrofit existing buildings. 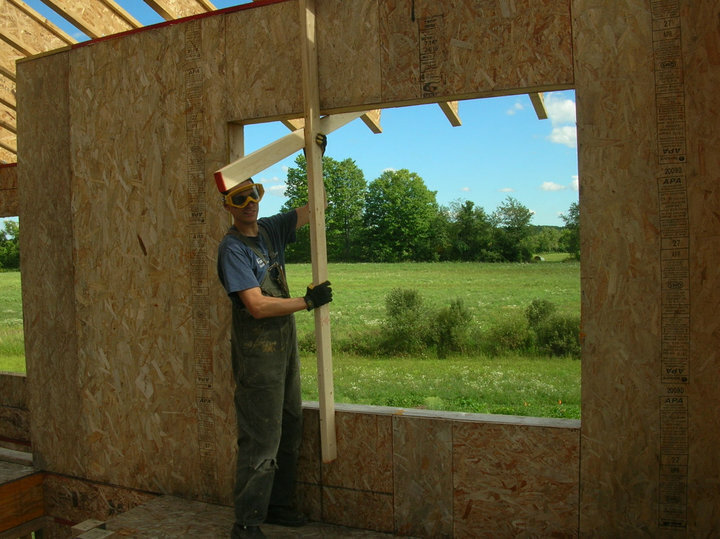 In cold climates, 20% of the economy can be dedicated in one way or another to keeping warm. 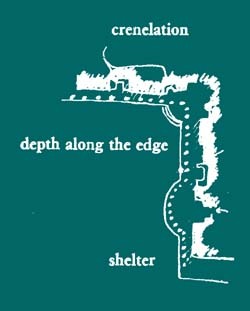 For areas below the Arctic Circle, this need not be the case. On a sunny winter’s day at 45°N (or south) latitude, there is around 957 Wh/m2 available to us for heating… if we use it. This is almost equivalent to the energy used by running a 1000W hairdryer for one hour falling on every square metre of ground. 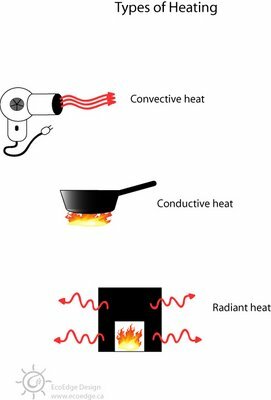 There are 3 types of heating available to us: convective heating (heating using hot air), conductive heating (an object coming into contact with a hotter object), and radiant heating (heat radiating off a hot object such as the sun). While conductive heating is the most efficient, it is not practical for heating living spaces. Convective heating is the most common, but is also the least efficient. 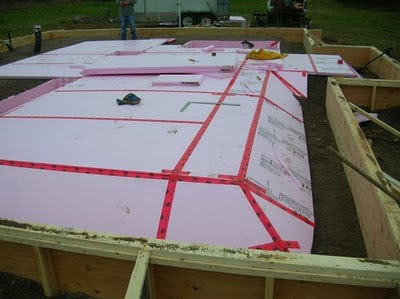 Radiant heating is the most efficient means of heating that is available to us. 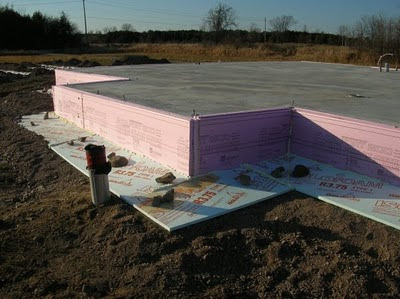 Luckily, we can get the sun to help us to use radiant heat. To capture the sun’s heat, we use a technique called passive solar heating. We allow visible sunlight to enter a building through a window. 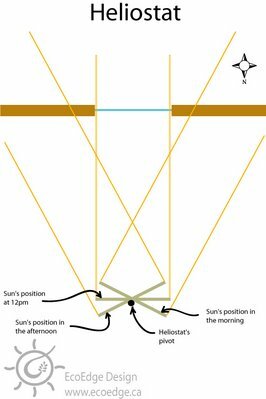 When the sunlight hits objects in a room, some of that light is transformed into longer wave infrared light or heat. 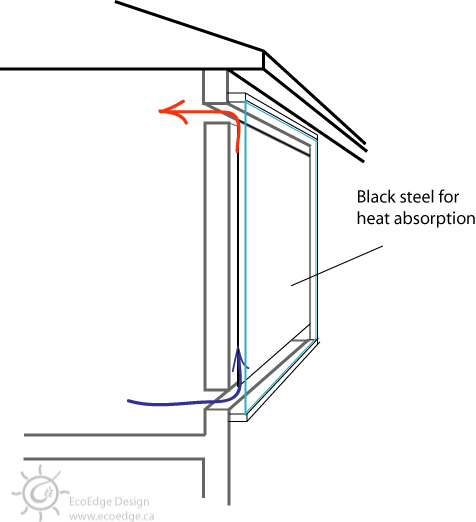 The windows then prevent most of the infrared light from escaping the building. Massive structures (concrete, brick or even water tanks) called thermal mass are used to store the heat generated and slowly re-radiate it into the building. 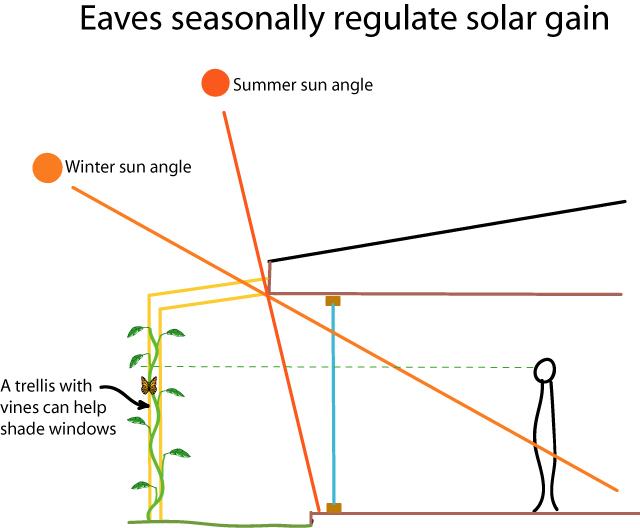 Although it seems obvious, it should be stated that passive solar systems need to be oriented towards the sun. It is worth mentioning because people have made the mistake of not doing this in the past. 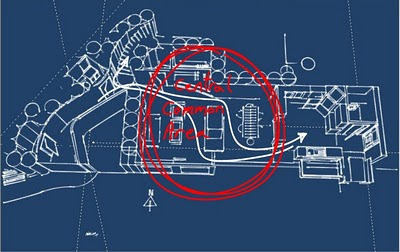 It is best that buildings are oriented so that they are within 10° of the polar axis (i.e. due south if you are in the northern hemisphere). 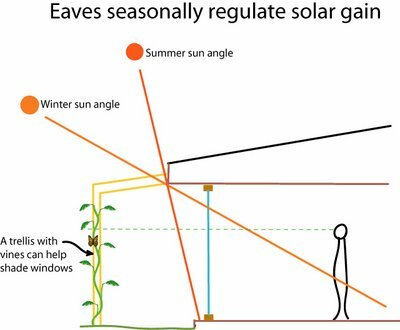 Because the change in the sun angle is so great in temperate areas where passive solar heating is needed, the system automatically adjusts solar gain throughout the season. 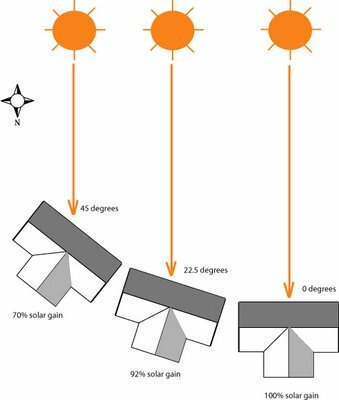 In the summer when heating is not needed, the sun is high in the sky meaning that the eaves of the roof cut solar gain. 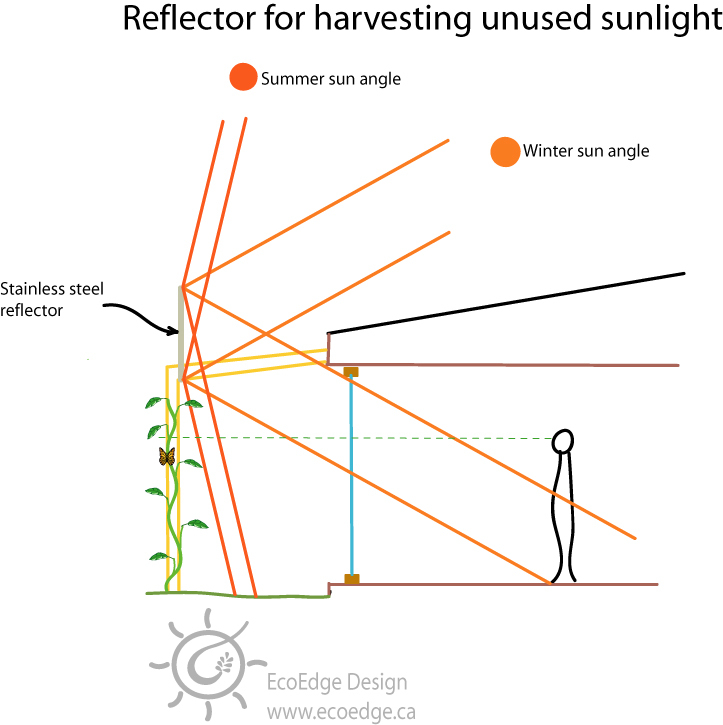 In winter, the sun is low admitting more light and allowing more solar gain. A technique sometimes used on new homes is the trombe wall. From the outside, a trombe wall looks like a window built over a wall, but it is a very effective passive solar technique. 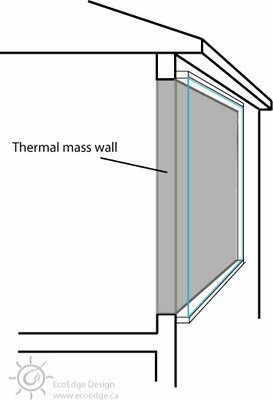 A thermal mass wall is built then covered with glass to trap the heat it stores. A cheap, portable version can be made of water-filled bottles and placed next to a window to make use of that window’s solar gain. 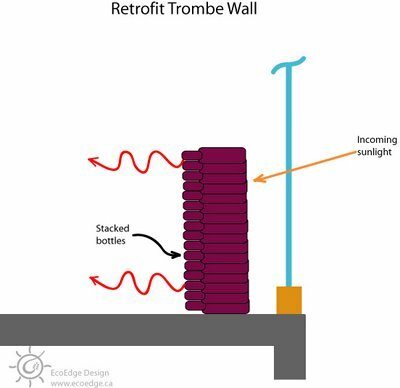 As sunlight strikes the wall, heat is stored in the water to be slowly radiated outward. 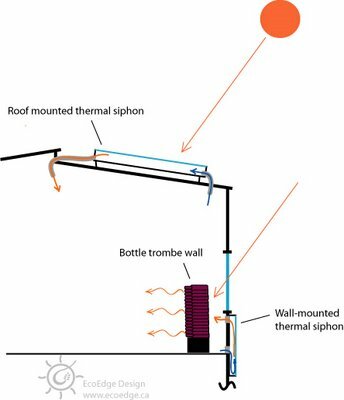 Thermal siphons are another retrofitting option; and finished, ready to use units are sold in Australia under the name Sun Lizard. To save money, you can make your own out of easily found materials. To do so, you would construct an insulated box with a black piece of corrugated steel inside and a glass top. 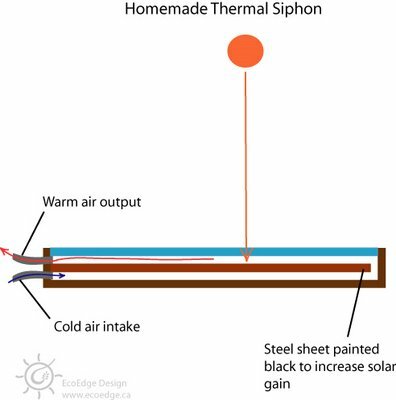 Solar powered fans can be used to increase the air flowing through a thermal siphon. Windows will lose heat at night, so covering them up can save a lot of energy. The best method would be an internal shutter that completely covers the window. If that is not possible, heavy curtains can be used to help stop heat loss. 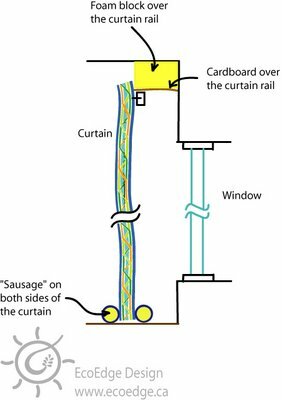 The drapes need to seal off the window, so attaching the sides of the curtains to the wall with Velcro is a good idea. From there, the top is sealed off with a foam block so that air cannot enter from the top of the curtain rod. The bottom is sealed at the floor with cloth rolls on the inside and outside of the curtain. 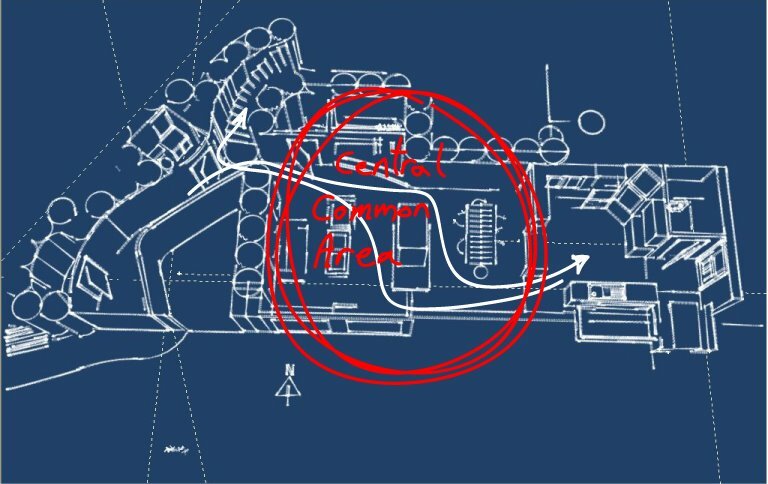 As an example, we took the building housing Noah’s Café in Nakano Ward in Tokyo. 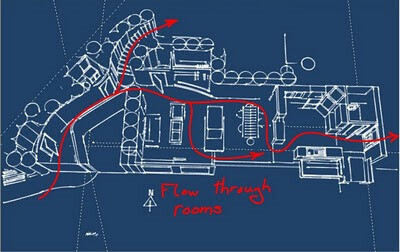 The orientation of the building was not bad (close to due south), but neighbouring buildings blocked a lot of sun reaching the first floor. 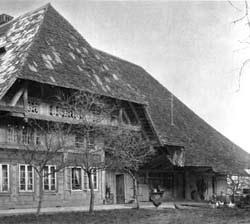 The second floor and roof, however, have good solar access that could be tapped. 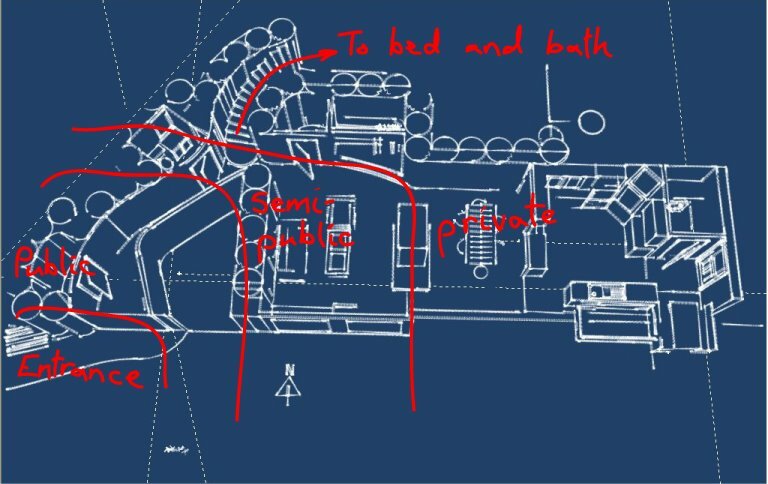 Some possibilities include a bottle wall in the second story window and thermal siphons on both the wall and the roof of the building as shown. To keep in the heat generated, curtains could be fitted as described above. Additionally, blown-in cellulose insulation could be used to insulate the walls and attic of the building, which are currently uninsulated.